HomePeter's blogsGospel in the StarsWill the True Messiah Please Stand Up? Many passages in scripture talk about the dual nature of Messiah Yeshua, that He is both God and man. So how do we know that Yeshua the Messiah is both divine (YHVH Elohim) and human? Scripture makes very clear this dual nature of Yeshua, and we know that we can believe the testimony of Scripture because all Scripture is inspired by God and is true and good for doctrine, teaching, etc. (2 Tim 3:16). We can see clearly from these scriptures that Yeshua could not have taken away our sins unless He was both fully human (so He could identify with us in our human weakness) and fully divine (so that He had the power of the Holy Spirit to defeat the enemy, HaSatan). It is true that we now have the power of the Holy Spirit within us, when we have been baptized into that power. However, Yeshua has a special relationship with the Holy Spirit and Abba Father, in that He is One (Echad) with them as persons of the triune God, Yehovah Elohim. 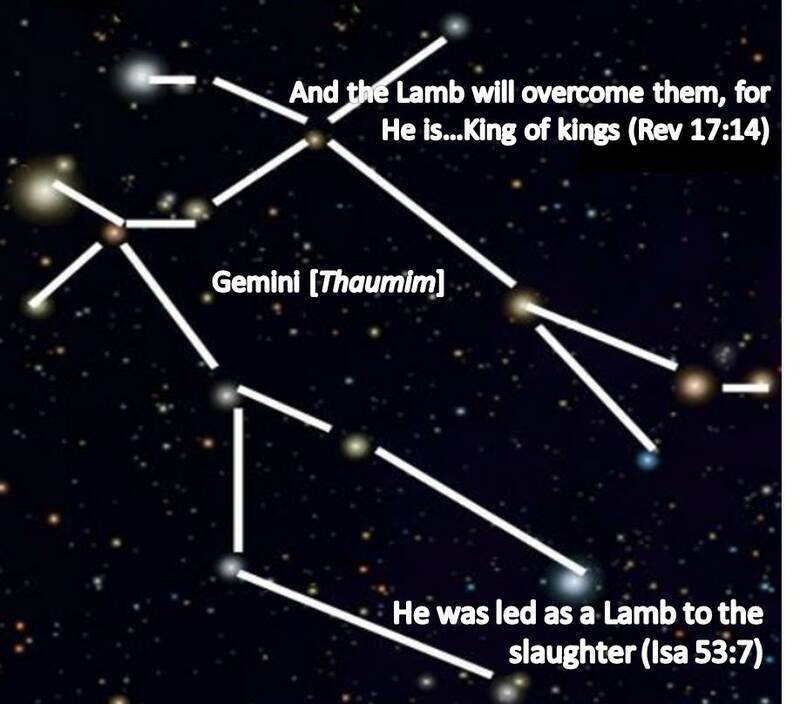 To put this into a context that might be easier for us mortal beings to understand, YHVH has painted the entire Gospel message into His star-pictures in the sky. We have looked at some of these in depth in previous blogs, but here I just want to give you a brief snapshot of one of them to help clarify Yeshua’s duality as God and man. Most people have heard of Gemini as one of the 12 signs of the Zodiac. However, as with the others, its meaning has been corrupted over the ages through pagan mythology and astrology. The original Hebrew name for this sign was Thaumim, which means united, or twinned, as in Exodus 26:24. In most of the myths about Gemini, twin brothers are represented; they are sometimes seen as heads of armies or great pirates on the seas (sons of Jupiter), which is why they were looked on as “patron saints” of marine navigation. The ancient star-names paint a very different picture, though, of a single person with a twofold nature–God and Man. They tell the story of His twofold work of suffering and glory, and His twofold coming in humiliation and in triumph. Two of the 85 stars in this sign point this out very clearly; the star Apollo in the head of one means ruler or judge, while the star Hercules in the other’s head means “the One who comes to suffer”. The best translation of the Hebrew name of the sign (Thaumim) is “united into one”, in the same sense that Yeshua is one person of the Godhead, but has two distinct natures united together in His one essence. This sounds like the greatest thing that could ever happen to us, that Abba Father and Yeshua His Son would come make their home with us! Do you want this? It means sacrifice and commitment for someone to keep His commandments (His word) day-by-day. As Yeshua promised, Abba sent the Ruach HaKodesh to help us every moment of our lives – do you think the Holy Spirit can also help you to stay faithful to Yehovah’s Word? Is it worth trying?